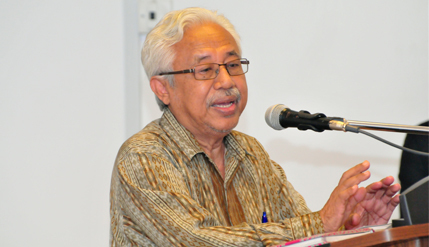 BANGI, 26 September 2014 – A renouned archeologist Professor Emeritus Dato’ Dr Nik Hassan Shuhaimi Nik Abdul Rahman believes that Hang Tuah did exist because his tomb was found in Tanjung Kling Melaka. The Principal Research Fellow at the Institute of the Malay World and Civilization (ATMA) of The National University of Malaysia (UKM) said the discovery of the ancient grave there confirmed that Hang Tuah was burried there. He was delivering his lecture on ‘Hang Tuah: Between Myth and Reality’ as part of the Tun Seri Lanang series here today. Prof Nik Hassan said the tomb was discovered in 1981.The Islamic Religious Council feared it would become a place of worship, and restoration was then not made. However, in the 1990s the then Chief Minister of Malacca, Tan Sri Abdul Rahim Thamby Chik decided to repair the tomb and promote it as a tourist attraction. He said the tomb was long as befitted someone of a heroic status in the days of the Malacca Sultanate when persons of importance had graves that were large. Besides that, he drew references from the literature Sejarah Melayu (the Malay Annals), Hikayat Hang Tuah and research work of Prof Dr Sulastrin Sutrisno titled ‘Hikayat Hang Tuah: Analysis of structure and function’, at the University of Gajah Mada, Indonesia. He also used numerous sources from oral history of which there are many. Prof Nik Hassan said there are also the works of many scholars whom he found to have acceptable facts. If story-telling and literature were about real places and historical governments, it would be reasonable to believe that the Malay hero also lived and that it is simply not a fairy tale. Prof Nik Hassan admits that no dates were mentioned at all in the entries of the old stories. Modern researchers have to refer to other sources to determine the time based on the incidents and the names of the kings or emperors, as had been done using the Chinese Ming Dynasty in the 15th century AD. British researchers like R.O. Winstedt and R.J. Wilkinson assumed Hang Tuah was a figure in literature merely because they accepted the stories as literature and not history. Renowned scholar Tan Sri Prof Emeritus Dr Khoo Kay Kim had also said that evidence of the existence of Hang Tuah must be brought forward to show the warrior actually existed. Deputy Vice-Chancellor (Industry and Community Network) Prof Dr Imtan Ho Abdullah and Head Librarian Hafsah Muhammad were among those who attended the lecture.